The US price of the body only is $999 (available in black, silver and white), the kit will cost $1449 and the VF-4 is $279. The black versions of the 17mm f/1.8 ($499) 45mm f/1.8 ($399) and 75mm f/1.8 ($899) lenses were also announced. 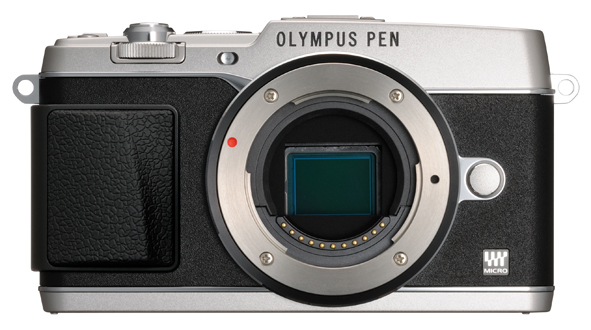 CENTER VALLEY, Pa., May 10, 2013 – Olympus marks the 50th anniversary of the legendary PEN F with the launch of the new Olympus PEN E-P5, a digital update of a classic film camera designed with breakthrough technology and incredible performance advancements. Designed for photographers looking for superior image quality in a portable body, the PEN E-P5 delivers a stellar shooting experience with 1/8000th of a second shutter speed – a world-first for the Compact System Camera class – built-in Wi-Fi, autofocus advancements, easy-access manual controls and a host of other features. The new flagship in the Olympus PEN series exudes detailed craftsmanship, from a seamless design to an all-metal casing that houses many of the same award-winning technologies found inside Olympus’s premier Micro Four Thirds® camera, the OM-D E-M5®: 16-Megapixel TruePic VI Live MOS sensor, FAST AF, 5-Axis Image Stabilization and more. The Olympus PEN E-P5 is the first Compact System Camera with a mechanical shutter that can achieve a speed of 1/8000th of a second to freeze fast-moving subjects like insects in flight or to create pictures with dramatic background blur, even in bright conditions. The built-in flash, with an improved, faster 1/320th of a second synch speed, makes it easier to take backlit shots during the daytime. Never miss an instant photo opportunity with features like quick start-up, new short release time lag AF mode, which reduces the time between shots to 0.044 seconds, and nine-frame-per-second sequential shooting. A world class autofocus system, also found in the Olympus OM-D E-M5, powers the E-P5’s new Super Spot AF, accurately bringing into focus even extremely small subjects. Simply select an area on your subject where pin-point accurate AF is required and the E-P5 can auto-focus on that area - offering even more precision than phase-difference autofocus systems. New Focus Peaking dramatically improves the usability of manual focus lenses by bringing shots into focus by emphasizing the contours of the point of focus in white or black. 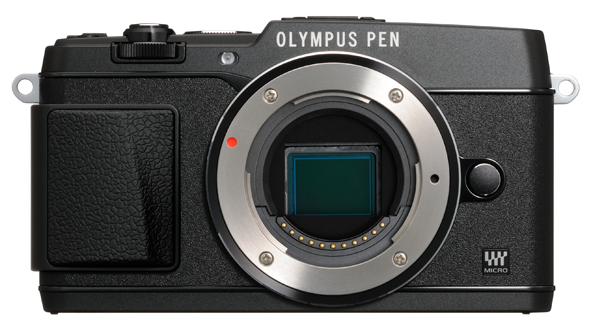 The camera’s in-body 5-Axis Image Stabilization mechanism, which has been further evolved since its introduction in the Olympus OM-D E-M5, is now compact enough to fit in the E-P5’s svelte body. The system corrects various kinds of camera shaking, whether shooting still photos or recording movies and the new IS-AUTO mode automatically detects the camera's movements and provides optimal control of correction when panning regardless of direction or camera orientation. Correction-checking on the Live View screen makes it possible to check the image stabilization effects on the Live View screen that was previously difficult with in-body image stabilization systems. The user can press the shutter button halfway to check the image stabilization effects on the display and then decide upon the composition. The image remains on the display for two seconds after the shutter button is released, making it possible to stabilize the autofocus point and set framing. Multi-motion IS used in combination with the 5-Axis Image Stabilization mechanism produces excellent correction performance, especially during movie recording. Hands-on photographers will appreciate the intuitive 2x2 Dial Control system which is in easy reach on the back and top of the camera. When shooting manually, a lever on the back can be quickly moved to one of two positions. In the first position, moving the dial at the front of the camera adjusts the aperture while the back dial affects exposure time. In the second position, the dials change the ISO value and white balance. Alternatively, you can use the lever on the back of the camera to assign a range of other functions. 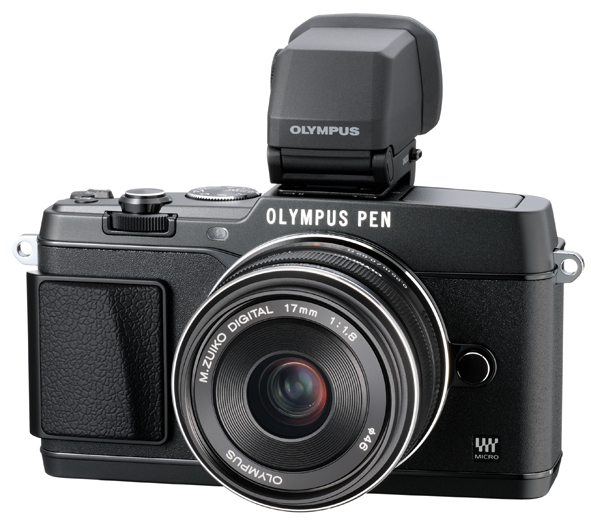 The E-P5 is the first Olympus camera to include built-in Wi-Fi. 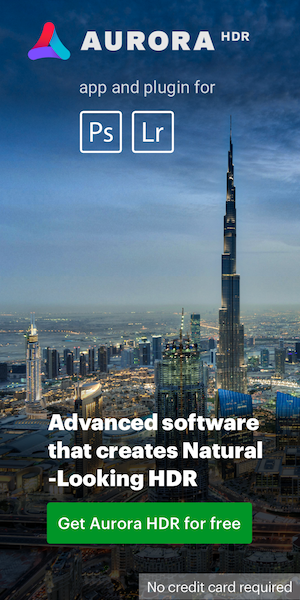 Setup is simple and involves quickly scanning the QR code displayed on the camera's LCD with your Smart device to synch it with the Wi-Fi network created by the camera. Olympus’ free smartphone app, Olympus Image Share 2.0*, synchronizes your smartphone’s and E-P5’s screens so you can effectively see the camera’s LCD on your phone and control it by touching the smartphone display as if it were your camera. This is extremely useful for self-portraits and for remotely shooting subjects like wildlife that are easily startled if you get too close. You can count down to shutter release on the phone itself, grant friends’ devices access to selected images, and even use your smartphone to embed GPS information in your shots. Photo Story mode enables you to capture a scene from multiple viewpoints and then combine them into a single image to create unique collages inside the camera. New "Photo Story+" adds a rich variety of stamps and "Signature" for adding a handwritten or original image signature on top of the image through the Oi.Share app. Other creative features include new interval shooting that sets a time interval between 1 second to 24 hours, as well as how many shots the camera will capture in a series (1 to 99) during that time to create images that show the growth of a plant, the drifting of clouds, moving crowds or a butterfly emerging from its chrysalis. Time Lapse Movie converts the series of pictures taken using interval shooting into a movie inside the camera. The 12 available Art Filters on the E-P5 lend even more creativity to time-lapse movies as well as still images. Live Bulb mode has been improved by automatically reducing the monitor's brightness to prevent glare and to display a histogram and the elapsed time of an exposure to more easily shoot stars, light painting and fireworks. 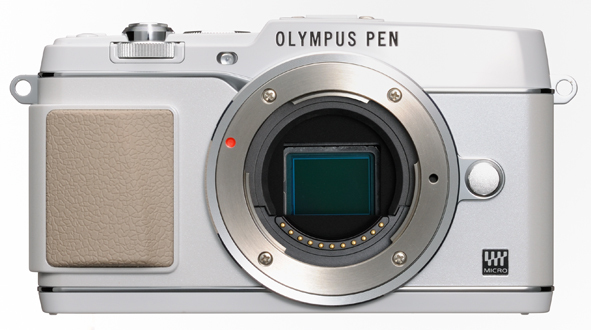 The Olympus PEN E-P5 is equipped with a bright and viewable 1.04 million dot high-definition tilt-type touch panel LCD that can be adjusted to face upwards at an 80-degree angle and downwards at a 50-degree angle. 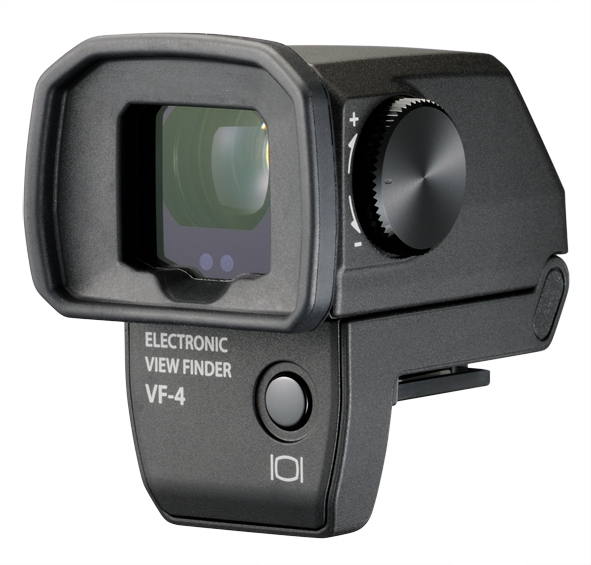 For photographers who prefer composing their shots using an eyepiece, the new optional high-definition VF-4 viewfinder, provides an impressive 1.48X magnification, a 2.36 million dot LCD, eye detect to turn it on at the right time, and intuitive functionality that enable real-time viewing of shooting conditions. The Olympus PEN E-P5 is compatible with the whole Micro Four Thirds range on quality lenses, which now extends to newly introduced black versions of the M.ZUIKO® DIGITAL 17mm f1.8, 45mm f1.8 and 75mm f1.8 lenses. 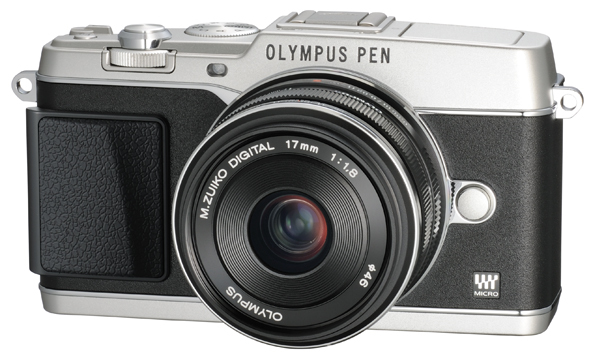 The Olympus PEN E-P5 will be available in May 2013 in the following configurations. This entry was posted in Olympus and tagged Olympus E-P5. Bookmark the permalink. Trackbacks are closed, but you can post a comment.